It’s been long overdue and there’s no time like the present so I’ve decided to spice things up and do a book tag. 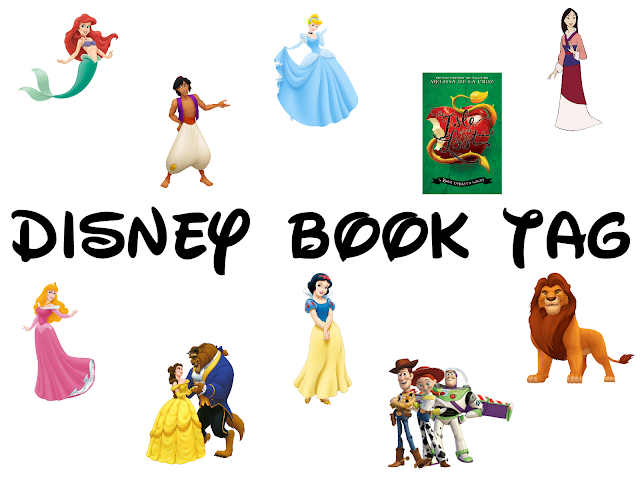 What’s even more great is that it’s the Disney Book Tag! It was originally created by the lovely BookTuber Kat from Katytastic in honour of the soon-to-be released Disney novel The Isle of the Lost by Melissa de la Cruz which I’ll of course be purchasing as soon as I can. I enjoyed her video so much that I thought I’d give it a go which I hope you lovely readers don’t mind but if you like both books and Disney I’m sure you’ll be fine hehe! Cath from Fangirl was very much out of her comfort zone when she finds herself alone at college when her twin sister Wren says she doesn’t want to be roommates with her. She’s used to it just being her and her sister so she starts to struggle when it comes to her being by herself as she’s very shy compared to Wren. Charlie from The Perks of Being a Wallflower at the end of the book wasn’t the same Charlie from the start. When you’re first introduced to Charlie he’s caring and thoughtful but also quiet, confused and I think depressed because of past events. However after starting high school and making new friends, people he can now trust and talk to, he starts to come out of his shell and become happy with himself and his life. This was a difficult one for me to answer without repeating an answer I already said and I didn’t want to skip the answer because I’m determined so I’ve chosen All My Friends are Superheroes simply because of the quirky types of superheroes there are! The Hobbit makes me feel sleepy but not for the reason you might think. When I was a little it was read to me at bedtime so I think it just reminds when of going to bed which has resulted me only wanting to read it at night haha! Wade from Ready Player One didn’t exactly have the best childhood. His dad got shot died while trying to burgle a shop, his mum died from a drug overdose and he had no one to confide in because he didn’t have any friends.. So OASIS, the virtual reality game, was a way for him to escape from reality and the only place he was really happy! The Book Thief is what you’d call a beefy book and I was worried I might not finish it.. but I proved myself wrong because I ended absolutely LOVING the book and I highly recommend reading it! For me it’s a mix between Hazel and Gus from The Fault in Our Stars as it was Hazel’s dying wish to go to Amsterdam and meet an author she was obsessed with. Gus helped her make it happen however meeting the author wasn’t what Hazel had expected and not in a good way. Nick and Amy from Gone Girl are two very complicated, messed up people in their own way. Amy is a compulsive liar who’s done some disturbing things. Nick seems to have some daddy issues and he tries to come across as this innocent man when really he’s anything but. They’re both pretend to be a normal, happy couple in front of everyone but they really are not.. Read the book and you’ll see! This will not come as a surprise to most of you but it has to be Harry Potter, obviously right? I would have to say the Jabberwock from Alice in Wonderland because firstly it’s a villain that I genuinely think is scary looking (as much as fictional character can) and can do harm which is how a villain should be! I know right? I would love to say that it was my idea but sadly it wasn't 😉 still so glad I done the post though! Oooh I really loved reading this post! Gotta agree with the Hobbit, my mum read that to me as a child at bedtime too, so I've always associated it with sleeping ahah. Love your other choices, haven't read all of them but I've definitely added a few to my reading list! This was so fun to read Ali 🙂 I love your choices for many of these questions too.